With 7,107 islands, the Philippines has many choices when it comes to a weekend island getaway in the sun ! 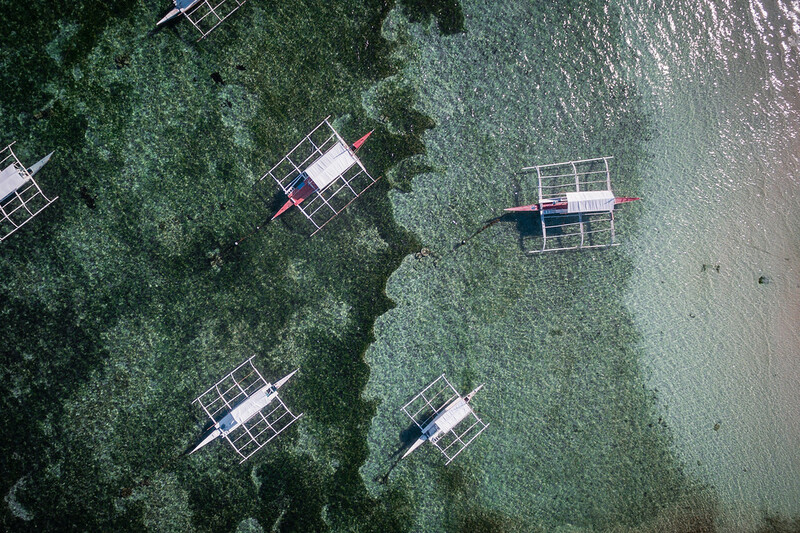 Since we were visiting Palawan Island in April to shoot our very first episode of Expedition 100, we also wanted to include our second best destination in the Philippines : Bohol. As you can imagine, choosing 100 places is a hard process. There are currently 160+ places I would like to include in our Top 100. So many difficult decisions to make. The Philippines have always been my dream destination and on top of all my bucket lists. Palawan is an obvious choice for a top 100 I think, but we also wanted to show you around Bohol. With a little time on our hands, we decided to make this a nature weekend getaway from Cebu city, as it is close by, and film a short bonus video for our web series ! But wait, there is more. We all live busy lives that can sometimes get stressful. I don’t know about you but I personally relax when I reconnect with nature. And when I travel, it means travelling in a more respectful and responsible way. 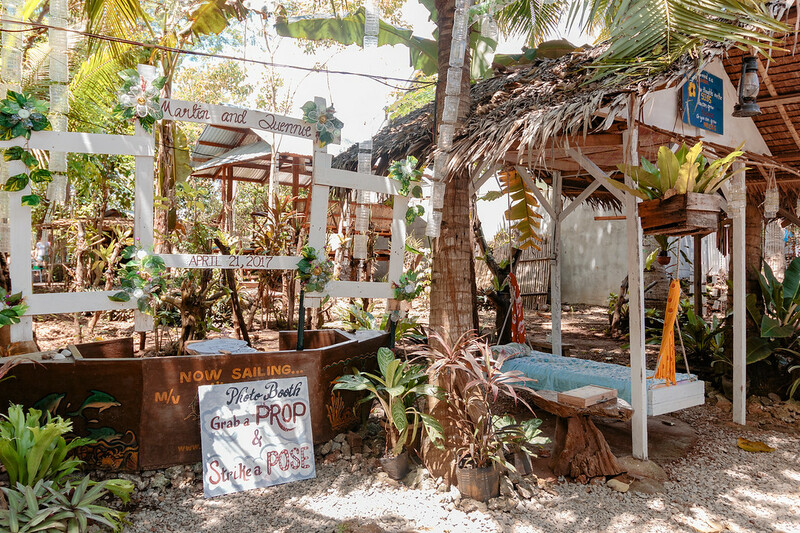 Here are a few tips and ideas for your next “back to nature” weekend in Bohol. Bohol’s airport is located in Tagbilaran. There are no International flights coming to Bohol airport, you’ll need to go through Manila or Cebu, and then hop on a connecting flight to Tagbilaran, which is super easy. You could also fly to Cebu and catch a ferry. Note that you will have to pay a terminal fee of 750PHP at Cebu International Airport. From Cebu or any other neighbouring island, you can catch a fast boat or a regular ferry (cheaper) to Bohol. The port of arrival can be Tagbilaran or Tubigon. Note that ferries to Tubigon are usually cheaper. From Tubigon you can then hop on a bus to your final destination on Bohol. The tarsier is endemic to Southern Philippines but also found in islands in Malaysia and Indonesia. 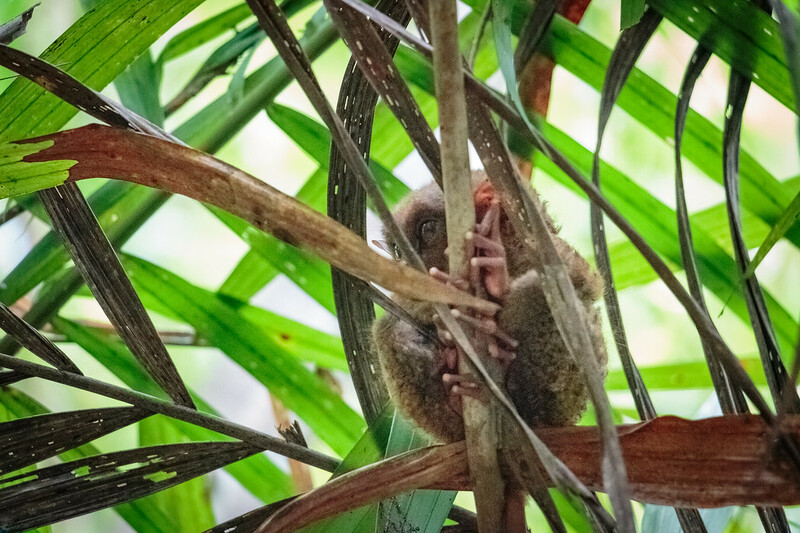 Bohol is not the only island in the Philippines where you can find tarsiers, there are also found on Samar, Dinagat, Leyte and Mindanao. They live on tree branches, mostly bamboo, in primary and secondary forests. 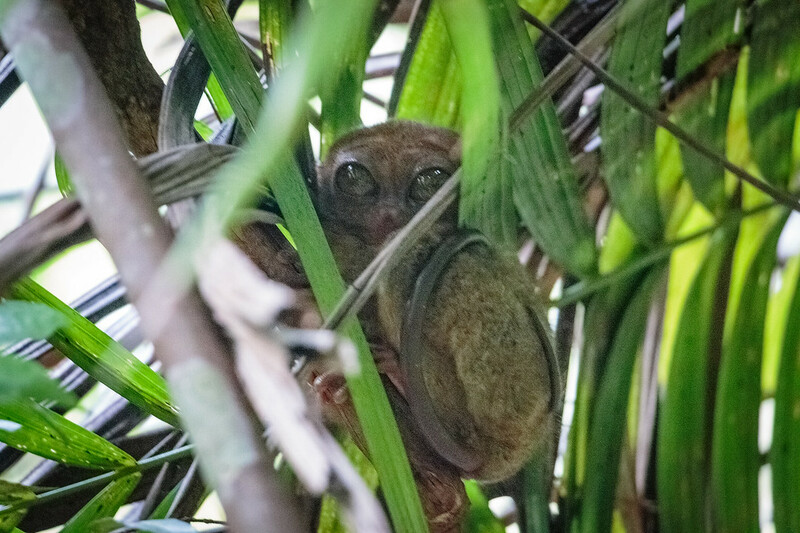 The population of tarsiers in Southeast Asia is declining mainly due to habitat loss. 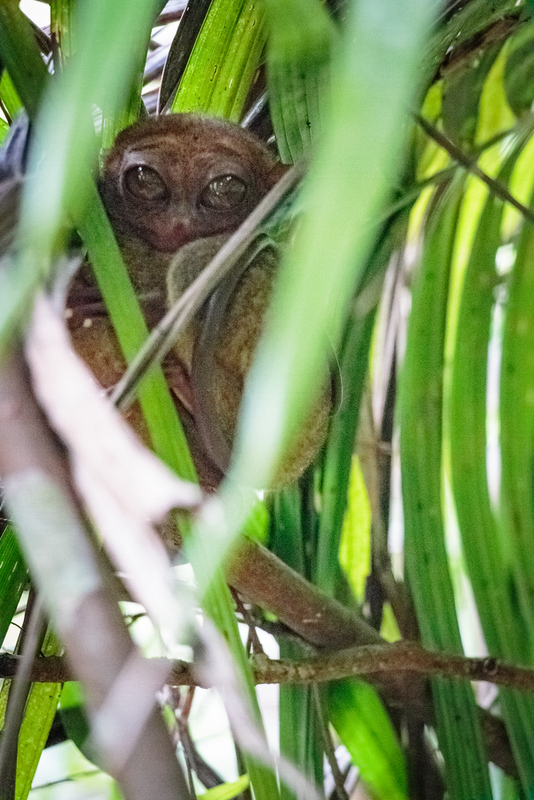 Deforestation for palm oil plantations and livestock, as well as pet trade, has had a terrible impact on the Tarsier population. One tarsier needs at least 1 hectare of space. Tarsiers can turn their head around 360° so they can see behind without moving its lower body, but their eyes stay still. The Tarsier is the only carnivorous primate in the world, they prey on insects, frogs, lizards, small birds. They are preyed upon by many other animals including snakes and big cats, but surely its biggest predator are humans. They are very sensitive. During captivity, they commit suicide if they are disturbed by noise, light and people touching them. 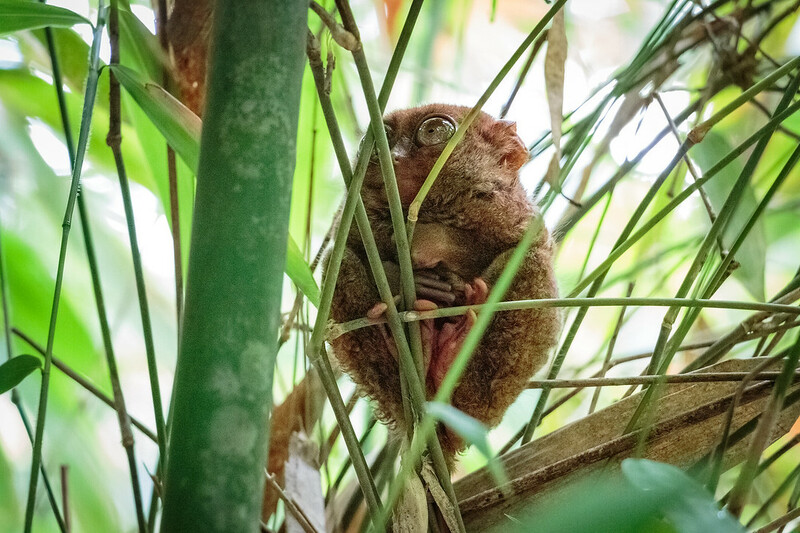 The best place to see the tarsier in its natural habitat is the Philippine Tarsier Foundation in Corella. There, you can be sure that the tarsiers are treated well and don’t live in cages but out in the jungle. Don’t visit the places along the Loboc river, they keep the tarsiers in cages and treat those poor animals badly. 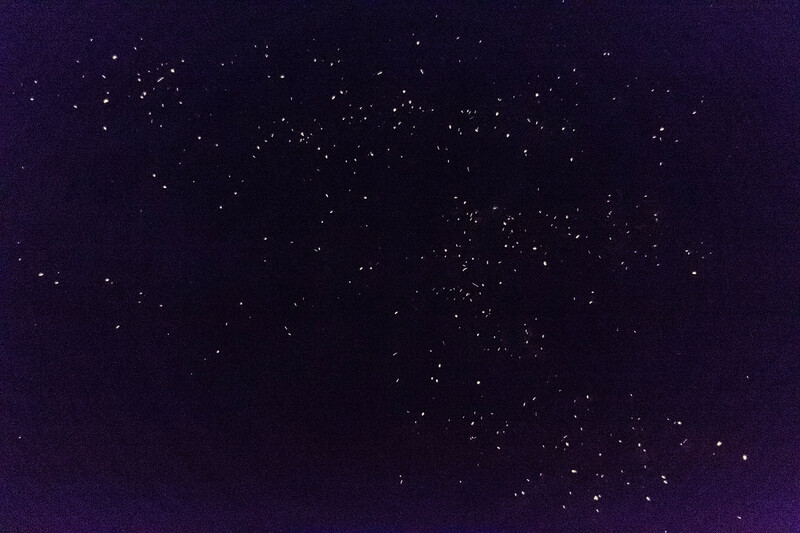 No this is not the night sky, these are fireflies in a mangrove tree ! Alongside the Loboc river you can see fireflies gathering in the mangrove at night, and it’s a wonderful sight ! We went down the river on a boat and we started seeing twinkling lights in the trees, they were so many of them I couldn’t believe my eyes at first ! Of course my photos are terrible since it was very dark, we were on a moving boat and I didn’t bring my tripod. There are many options for you to see them, you can rent stand up paddles or kayaks and stroll up and down the river at your own pace. You can also rent a boat with several other people to share the costs, that’s what we did. Have a look at Kayakasia Tours. 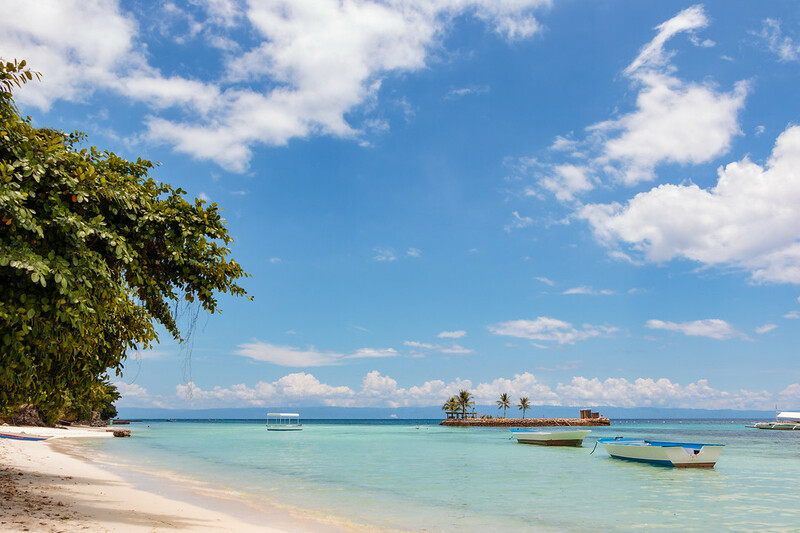 Bohol island has some amazing beaches and Panglao island is the place to go if you’re looking for some beach time. For most of them you will have to pay a small fee for parking your motorbike, around 50 pesos. We loved Dumaluan beach, it felt like we were the only tourists there among all the local families gathering for food and drinks in the restaurants alongside the beach. 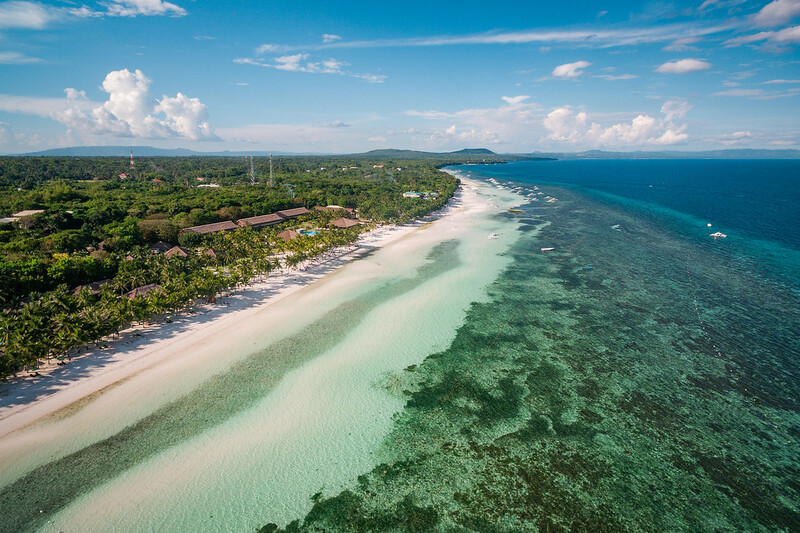 We had several other beaches recommended to us such as White beach and Alona beach. I put pins on their locations on the Maps I created for you down at the end f this post. 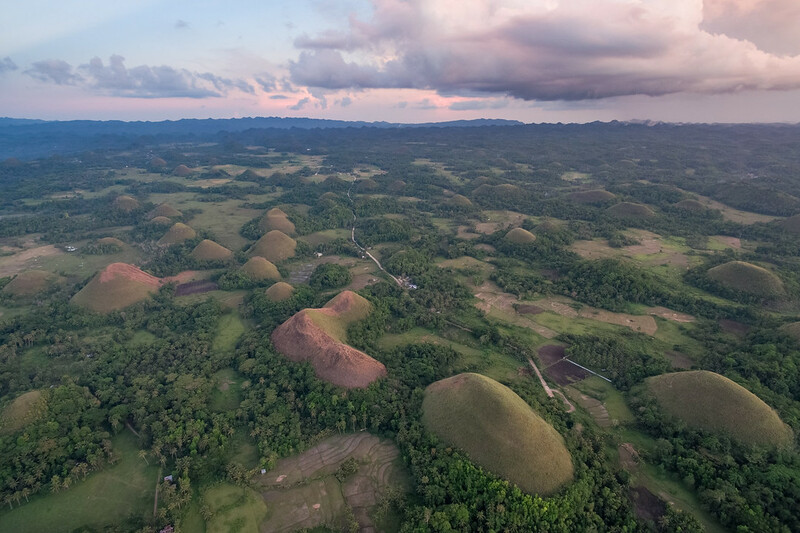 I kept the best part for the end of my quick lists of places to see on Bohol island : the Chocolate Hills of course ! 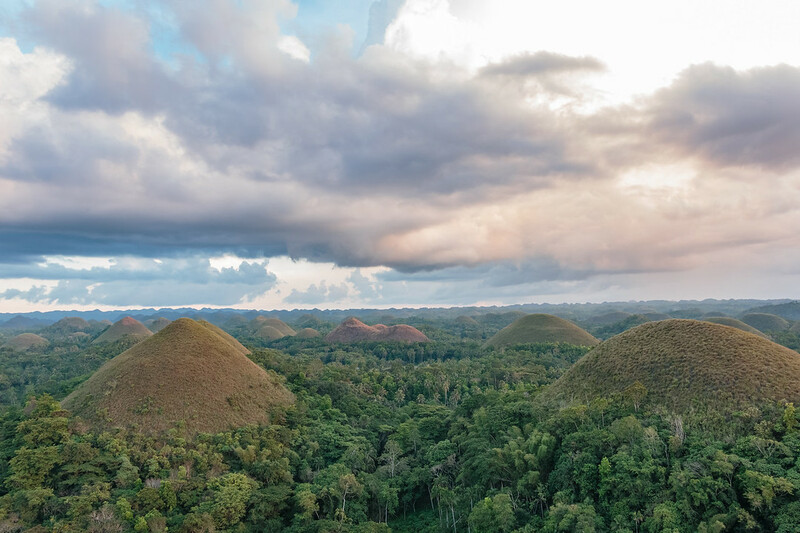 Located in the centre of Bohol Island, the Chocolate Hills get their name from the green grass that turns brown during dry season. It is a complex of more than 1,200 hills spread over 50 square kilometers and is listed as a UNESCO World Heritage Site. It took us quite a while to get there from Panglao. We planned on getting there on time for sunset, but it took us almost 2 hours and we were just a few minutes late to photograph and film with the sunset light. But we did get a pretty incredible view over the hills and it wasn’t too crowded. I bet sunrise would be an amazing time to see the Chocolate Hills as well. We paid 50 pesos each at the entrance, not sure if it was legit but we paid anyway. 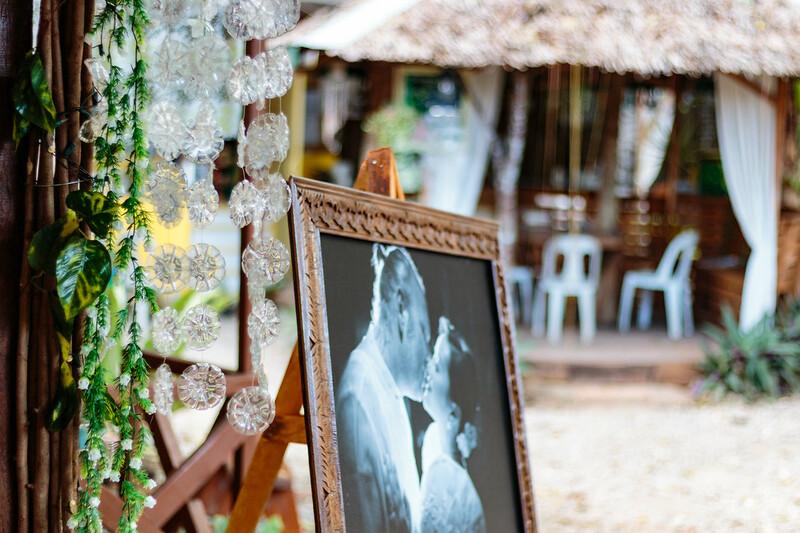 If you’re looking for a nature resort near the beach on Bohol that respects its environment, Natura Vista is the right place for you. The owners, Quennie and Martin, have created the perfect nature retreat for the environmental conscious traveller. Everything is recycled and reused. 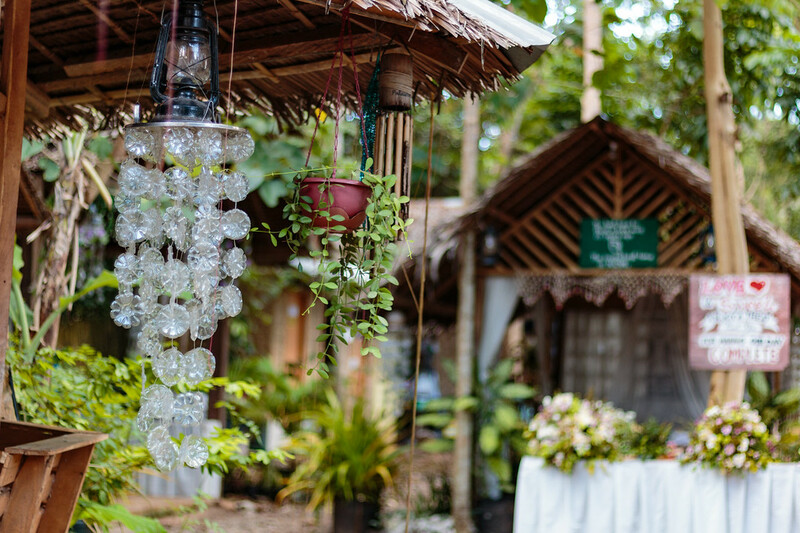 The garden was decorated with beautiful garlands and chandeliers made from plastic water bottles by Quennie’s mother. I am particularly sensitive to the subject of plastic use in our modern society, and I personally try to avoid using too many packages (if you want to know more about this, read our green travel resources section). So I love their idea to give a second life to things like plastic bottles, especially when it’s done in such an artistic way. 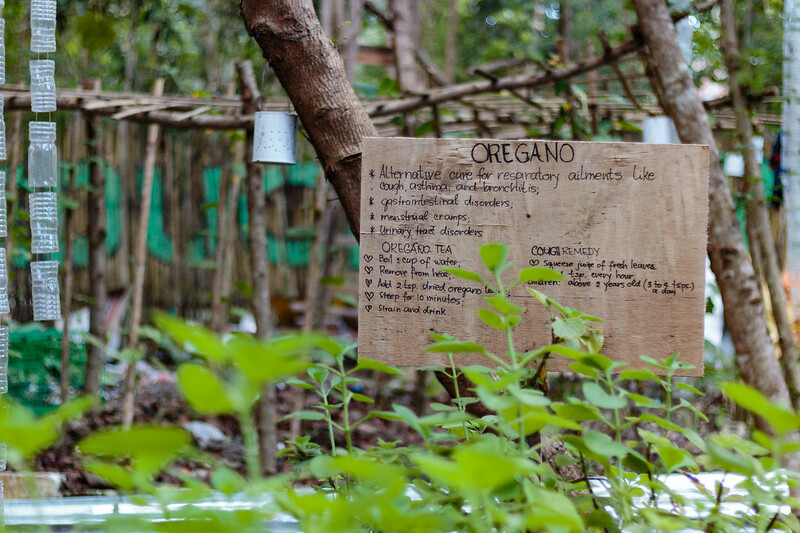 The delicious food served in the restaurant is grown organically in their garden. Rainwater is collected to water the plants and they organise regular beach clean ups. But I think what I liked the most is knowing that all the trees that were cut down to build the resort, were reused as furnitures and materials for the rooms. 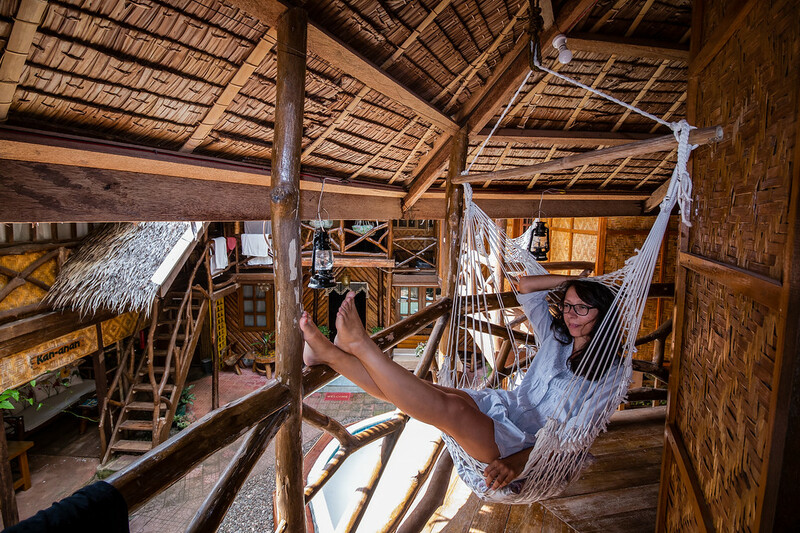 We stayed in one of the rooms on stilts with a balcony. The hammock on the balcony was a nice touch, so relaxing ! The only thing I wasn’t excited about was the decoration of the room which I think is a bit outdated and might need a little make over. But the room itself was very comfortable, especially the bed. 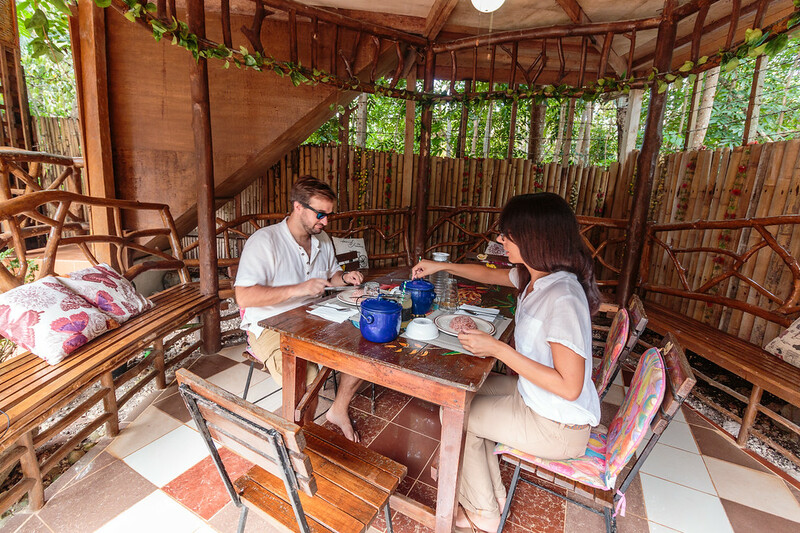 I loved taking my breakfast downstairs in the little outside lounge area. 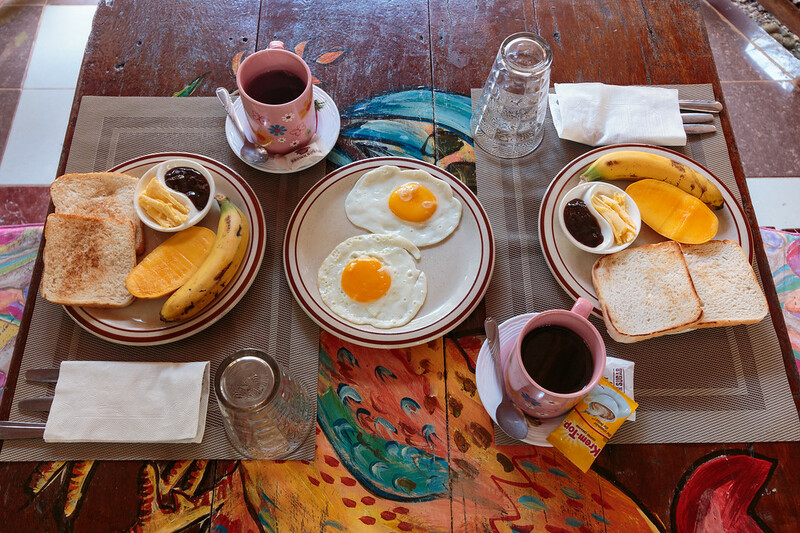 Staying at Natura Vista was as comfortable as staying at a friend’s house, it didn’t feel like an impersonal resort. We felt very welcomed by the friendly staff and would love to go there again !! Don’t forget to watch Quennie and Martin’s interview where they explain more about their resort by clicking “Explore” in the menu of the interactive episode ! Check their reviews here and book a room here. We highly recommend you to rent a motorbike to get around, that will be the easiest and cheapest way for you to get around the island of Bohol. Not the most eco friendly we have to admit, but it’s definitely the most convenient ! When arriving on Bohol by the ferry, you can either hop on a tricycle to get to your hotel or guesthouse and then ask them for a motorbike rental, they usually have a deal with a motorbike rental company on Bohol. Or you can also walk a few meters and rent one from one of the rental shops close to the ferry terminal. Otherwise, it is pretty easy to hop on and off tricycles or any buses really. There you go, some of the travel advice we could gather from our nature getaway weekend in Bohol, Philippines. Since we were there for a short time, this is a non exhaustive list of things to do and places to stay. If you have more to add, let us know in the comments below ! We want to thank Quennie and Martin from Natura Vista for inviting us. All costs other than accommodation were covered by us. All opinions remain our own. By clicking on some of the links in this article, you help support this site at no extra cost to you. Thank you ! I’m glad you’ve found some useful info, enjoy your trip to Bohol ! !